My mother always cooked and really well too, she used to have all sorts of biscuits and cakes and buns waiting for us when we came home from school.She also made jams and so did my mother in law, I was always fascinated by their skills although none of it unfortunately rubbed off on me. Oh no not a skerrick rubbed off, my husband Bryan is the cook of this family and for a very good reason. I burn everything even water he is fond of telling me, you know it is actually possible to burn water if you forget it is on and let it all cook away then you will burn the saucepan.. well I am good at that. So lucky I at least could paint food to satisfy at least a little bit of my cravings! However I am fascinated by the process of cooking and I do looooove food, I also like to paint food, I am interested in the different colors and textures. Perhaps it also stems from a life deprived of food during my modelling days, when just looking at it would make you gain weight & old habits die hard even as an artist! 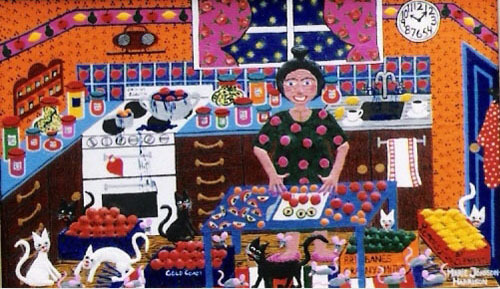 Here is a acrylic on canvas board painting of Jam making in a country kitchen, whilst the cats amuse themselves with the mice. This reminds me of a funny story that my brother just told me, which seems perfect for my art blog. My mother had decided to make toffee and unfortunately it had not turned out that great, it was incredibly sticky so she decided to throw it away and make another lot. She then thought, waste not, want not, and decided that the dogs may enjoy it instead. I think they probably had a little go at it but also found it impossible to eat and left it in their dog bowls outside overnight. So when my brother got up the next morning he describes a site for sore eyes. Stuck in each dog bowl were 2 sparrows, up to their knees in toffee and flapping their wings like crazy when my brother approached but to no avail-my mother’s toffee had set around their feet like glue. But, do not fear, they were duly rescued and all finished well. So that will have to be another painting idea for me next time. This is something Bill Cosby said, which made me laugh, being a vegetarian myself.